This textbook offers an insightful study of the intelligent Internet-driven revolutionary and fundamental forces at work in society. Readers will have access to tools and techniques to mentor and monitor these forces rather than be driven by changes in Internet technology and flow of money. These submerged social and human forces form a powerful synergistic foursome web of (a) processor technology, (b) evolving wireless networks of the next generation, (c) the intelligent Internet, and (d) the motivation that drives individuals and corporations. In unison, the technological forces can tear human lives apart for the passive or provide a cohesive set of opportunities for the knowledgeable to lead and reap the rewards in the evolved knowledge society. The book also provides in-depth coverage of the functions embedded in modern processors and intelligent communication networks. It focuses on the convergence of the design of modern processor technologies with the switching and routing methodologies of global intelligent networks. Most of the concepts that are generic to the design of terra-flop parallel processors and the terra-bit fiber-optic networks are presented. This book also highlights recent developments in computer and processor technologies into the microscopic and macroscopic medical functions in hospitals and medical centers. Syed V. Ahamed taught at the University of Colorado for 2 years before joining Bell Laboratories. After 15 years of research, he returned to teaching as a Professor of Computer Science at the City University of New York. The author has been a Telecommunications consultant to Bell Communications Research, AT&T Bell Laboratories and Lucent Technologies for the last 25 years. He received numerous prizes for his papers from IEEE. He was elected a Fellow of the IEEE for his seminal contribution to the simulation and design studies of the High-speed Digital Subscriber Lines. He has authored and coauthored several books in two broad areas of intelligent AI-based broadband multimedia networks and computational framework for knowledge. "....I would definitely suggest it to my colleagues who teach hardware / software design, embedded systems, network infrastructures, medical applications, mobile computing, software engineering, or information engineering." 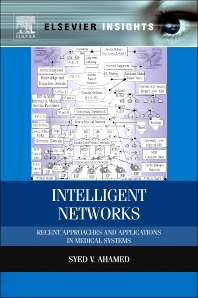 "Prof. Ahamed has been doing research and teaching the topics covered by this book, so I think he is the perfect author for a book on intelligent networks and their medical applications"
"There is (as far as I know) no book available that covers the here described topics (network design, hardware, wireless networks, medical networks) in one publication." "(The) book is perfect for students (undergrad as well as doctoral students) as well as researchers and practitioners working on the design of intelligent networks for medical applications. Students shall be taught all necessary basic knowledge and background, and since the book shall describe all state-of-the-art and leading edge approaches it should be perfect also for experienced computer scientists and IT / network engineers." "(The) book presents the latest innovations in Internet, Processor and Switching Technologies as well as Medical Networks and Processors, and there don’t appear any books which have discussed the above issues in detail."